NYC, 03/05/2019, 7:30PM. Scenes Through the Cinema Lens: Happy Birthday, Nat King Cole. 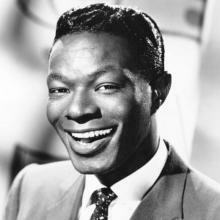 Born in March 1919, Nat King Cole had an especially intriguing career. Starting out as a rhythm and blues performer with a trickster’s manner, Cole crossed over to a white audience with “Straighten Up and Fly Right” in 1943 and then cemented his connection to white America with “The Christmas Song” (1946). See his appearances in several dramatic films as well as segments from The Nat King Cole Show (1956-57), the first series on network television to star an African-American performer.